Desmond Bane scored 30 points for the second time this month as TCU shot 51 percent from the field as team and defeated Nebraska 88-72 to advance to the NIT quarterfinals. “Good win for us, and I liked how we did it: with everybody,” head coach Jamie Dixon said. Behind dominant play from center Kevin Samuel, the Horned Frogs jumped out to an early 10-4 lead just 3:15 into the game. The Cornhuskers were unfazed though, responding with a 10-2 run of their own to take a 14-12 lead with 12:35 left to play in the first half. To make things worse for TCU, guard Alex Robinson picked up two fouls early in the half, potentially limiting his minutes for the rest of the game. TCU would settle down from there, locking up Nebraska defensively for the majority of the half. Guard James Palmer Jr., the Cornhuskers’ leading scorer, who averages 19.7 points per game, went 0-for-10 with zero points in the first 20 minutes. 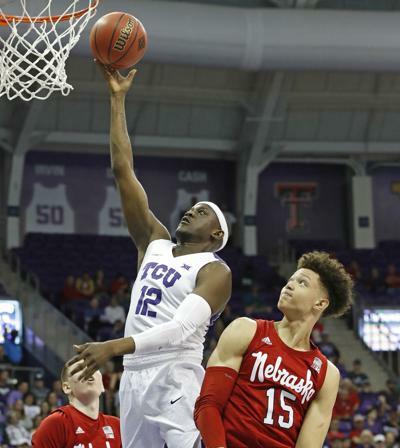 While Nebraska was struggling offensively, TCU shot 43 percent as a team. Behind strong play from Bane and an acrobatic layup by forward Kouat Noi at the buzzer, the Horned Frogs secured a comfortable 40-32 lead heading into the halftime break. Bane led all scorers with 10 points on 4-for-7 shooting through the first 20 minutes. The two teams traded punches to start the second half, with their leading scorers doing the majority of the work. For the Huskers, Palmer Jr. shook off his first half slump to hit his first three shots from behind-the-arc. On the other side, Bane scored eight points in the first five minutes of the half to keep TCU’s lead at eight, 55-47, with 13:52 left to go. Just two minutes later, guard Kendric Davis dove to the floor to fight for possession with Nebraska forward Isaiah Roby. The Cornhuskers won the possession, but Roby shoved Davis to the ground, resulting in both his fifth foul of the game and a flagrant 2 foul. The junior was ejected from the game as a result. Davis responded by making the two flagrant free throws and going on his own personal 7-0 run, including an and-one from behind the three-point line. The momentum put TCU up 66-54 with just 10:05 left to play in the game. The Cornhuskers wouldn’t go away though, as Palmer Jr. continued his second half scoring effort. A member of the All-Big Ten third team, the guard scored all 19 of his points in the second half, keeping the Horned Frogs’ lead from getting out of hand. In the end, Bane proved to be too much for the Cornhuskers to handle. The Richmond, Indiana native scored 20 points in the second half alone and finished with a game-high 30 on 10-for-15 shooting, including six made three-pointers. “I want to know how Bane got out of Big Ten country,” Nebraska head coach Tim Miles said, surprised that Bane didn’t get offers from his home state. This was Bane’s second time to reach the thirty point mark in March, as he scored 34 against Texas on March 9. The guard’s performance fed onto the rest of the team, as Noi, Davis, Samuel and JD Miller also finished in double figures in the contest. The win improves Dixon’s record in the NIT to 7-0 with TCU, as the Horned Frogs head to the NIT quarterfinals for the second time in three years. TCU will host Creighton at 8 p.m. on Tuesday, with a chance to head to the Big Apple for the Final Four.